RP6346SS is rated 5.0 out of 5 by 4. Rated 5 out of 5 by Leslie Onsager from Great for matching finish This product is helpful when needing a vessel drain that coordinates with your selected finish, as that can otherwise be an issue when trying to coordinate finishes. This grid strainer should be used when a vessel sink has no overflow. Rated 5 out of 5 by Doc Jakki from Sink Strainer Not much to say really. It does the job and looks good. Used it for the sink in our pool house bathroom. how long is the threading on the drain? Need the threading to be about 3 inches to get through vessel sink, trim ring and one inch of granite. What is the diameter of the hole needed in the vanity? I am looking for a grid strainer to coordinate with my Cassidy vessel faucet and my bowl shaped vessel sink. 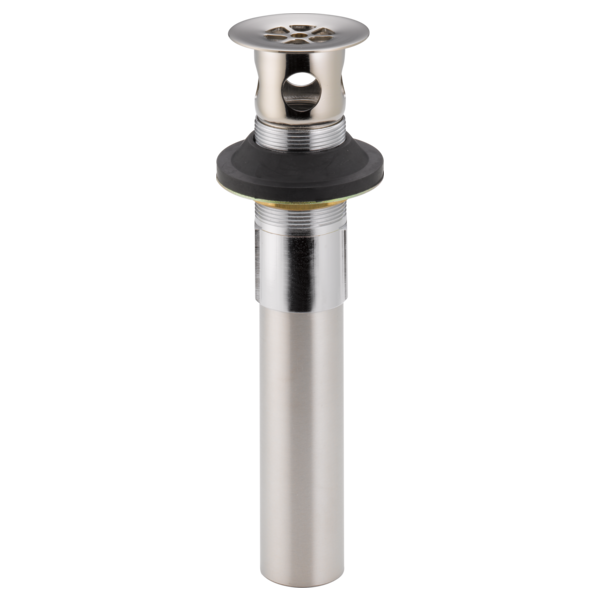 I am wondering which grid strainer model to order, the RP47648PN or the RP6346PN? and what are the differences? Thank you. Will this work with a hi macs 1612 sink that has a 1-3/4&quot; diameter drain hole? Buying a ceramic vessel sink to be mounted on quartz counter. Will purchase vessel waterfall faucet Victorian. What drain should I use? Need to ensure the drain is long enough to go through ceramic vessel sink and quartz countertop. Is this product exclusively for vessel sinks? I have a granite vanity top with an undermount bowl (with overflow). Is there any reason why I cannot use this item as I do not want a pop-up drain. Are there any obstructions that could catch anything like hair that gets below the surface grid?